We take a look back 8 years to September 2009 to appreciate again the wonderful flying photo's from our www.modelflying.co.uk photo competition. I have come across an ED MKIV amongst some stuff of my father´s. I want to try and get it running again, initially on the bench, and if that is successful then maybe try and fly it. Can any body suggest a suitable size of propeller for this old diesel, preferably not too expensive, just to get it running. Yeah, you need an old soft plastic or wood propeller, 10x6, 11x4 or 12x4. This video shows one of mine running well. Here's a link to the full test that includes the extract Denis has posted. An old AM plans handbook suggests a 10x6 - 12x6. IMO a 10x6 would be about right when fitted in a suitable vintage models with an 11x6 as a possible alternative. What you need is a Keil Kraft Trueflex, 10x6. 4/11 in 1953 money. Sad Old Git that I am, I've still got a few somewhere. I see no reason to run it on any special propeller unless you just want to be totally vintage. A modern glass 10 X 6 is perfectly acceptable. Of course you could use a vintage prop but I do wonder if the plastics of those days might not have deteriorated over the years. If you want wooden props J. Perkins list a Master 10 X wood prop for £3.75 plus many other sixes. Just for your information. Diesels do not run nearly as hot as glow motors. As a result you can solder up exhaust stacks from tin plate and even use soldered up silencers. No Peter, I still use KK Truflex for gentle bench running (great fun), and I still fly using Topflite plastic with sport diesels. They haven't deteriorated at all, they're just not suitable for modern high performance (schnürle) engines. Hello Peter if interested The ED story is an interesting read if you haven't already read it . ED numbering of engines was some times chaotic I even have some comps that have MK III cast onto the front housing instead of MK II ?. You are correct about soldering the exhaust for diesels . The 2 cc ED Comp Special or Mk II and its earlier incarnation named the Penny Slot up to the later 2.49 Mk III had cylinders assemblies that were soldered together . The exhaust stacks fitted on some models, the inlet tract and transfer ports were all soldered in place The Hunter also had an exhaust stack soldered on at one stage but ED were always changing things as they developed . could be that's why they were called Electronic Developments. 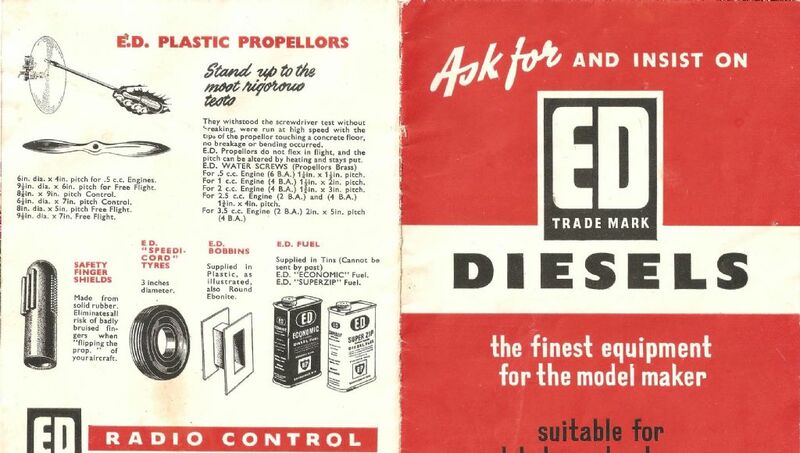 I can remember visiting the ED factory in about 1962 with a friend Rodney Johnson. Quite an experience especially the engine testing department. A chap would spend all day in the room that was obviously provided with air extraction and his PPE equipment was just some ear defenders. As you can imagine he had a whole pile of new diesel engines to test, the biggest being the Mile Special at 5 cc. I got him to test my ED Hornet which was always a poor performer. I wonder how he stayed awake with the over powering smell of ether ?. Other sections apart from engine manufacture included the electronics department, a very clean environment where their radio control kits were produced . They seemed very proud of this high tech production which of course lacked today's proportional technology. 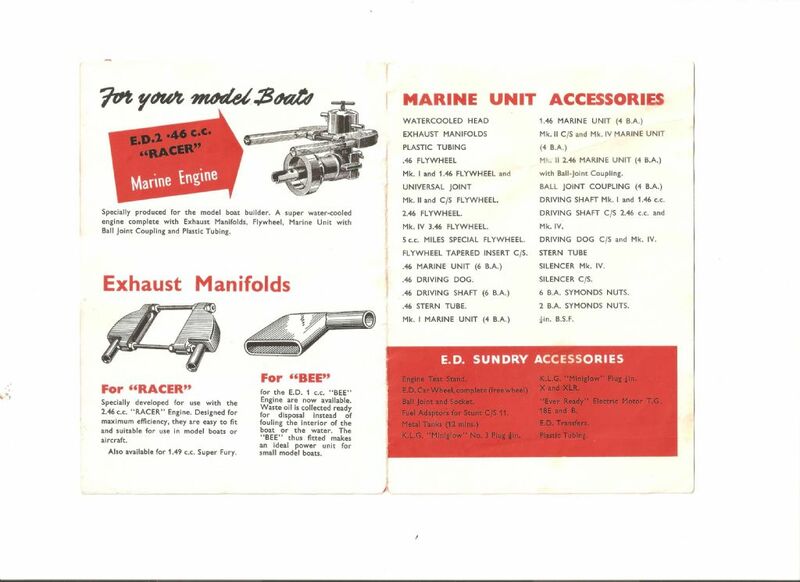 My friend Rodney had two ED Comp Specials which were extremely noisy and lacked power and the only thing he fitted one of them in was a Veron Skid Boat. which we sailed on Richmond Ponds. I still have my ED Racer from that period. I believe that Electronic Developments, ED, was first set up to manufacture hearing aids for ex soldiers returning from the war with hearing damage. Some thing I have just remembered about the factory visit was that both my friend Rodney and I chose / were obliged to give a school 'classroom talk' to the rest of the our class about the factory visit. Another former class mate Glen Pharoah reminded me recently that I started a DC Merlin in front of the class during the discussion. just by holding the Merlin in my left hand and squirting a small amount of fuel into the air intake and flipping the engine over.. After the classroom discussion,Rodney and I were then obliged to write an article for the school magazine about the factory visit. When it was eventually published the publishers employed by the school would not allow the article to be titled 'A visit to the ED factory', it had to be titled 'A visit to the EDC factory to avoid free advertising for ED-how daft ! Re the ED factory , I was talking to an elderly gent at the nationals some years ago about how some of the ED engines felt rough when new. I can't remember whether he said it was him or a friend who was a travelling salesman (rep) back then who was selling bearings and called into the ED factory. In the workshop he noticed that the ball bearing were being drifted into the crankcase . He asked the foreman if they had tried heating the crankcases to fit the bearings and explained the procedure saying that they should just push in while the case was hot without fear of damaging the races. On the next visit the bearings were still being drifted into place so he asked the foreman again . The foreman said that they had tried heating the cases in an oven but they had to let them cool down so as they could hold them to fit the bearings and the bearings were still tight so they gave up on the idea and went back to knocking them in ! Wether it was true or not I can't say but it is an entertaining tale from an engineering point of view. 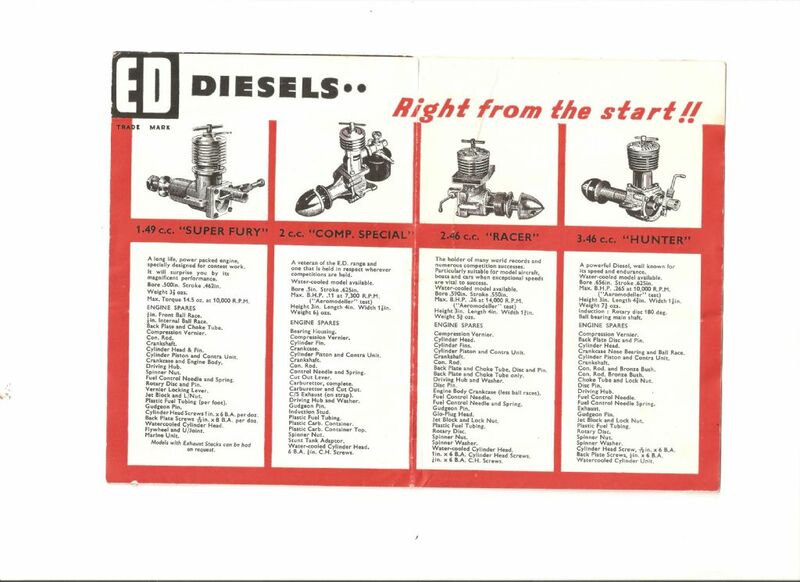 i found this old ED pamphlet yesterday I am not sure when it was produced but it seems to exclude the 5 cc 'Miles Special' although it does list a flywheel accessory and details the 0.8 cc Pep the only one of the range I have never seen. I do have one of their plastic propellers that fits the ED 'Racer' but it is quite amusing to read how the propellers are described in the pamphlet plus the spelling mistake. The 3.46 cc 'Hunter' is shown as their largest motor which of course is so much smaller than today's Glow and Petrol motors. Mike, the Pep and the Super Fury date your pamphlet as about 1960. The Pep was introduced in 1960 and didn't last long. It was made for ED by a sub-contracting firm called Bardsleys, in Brentford High Street if I remember correctly. 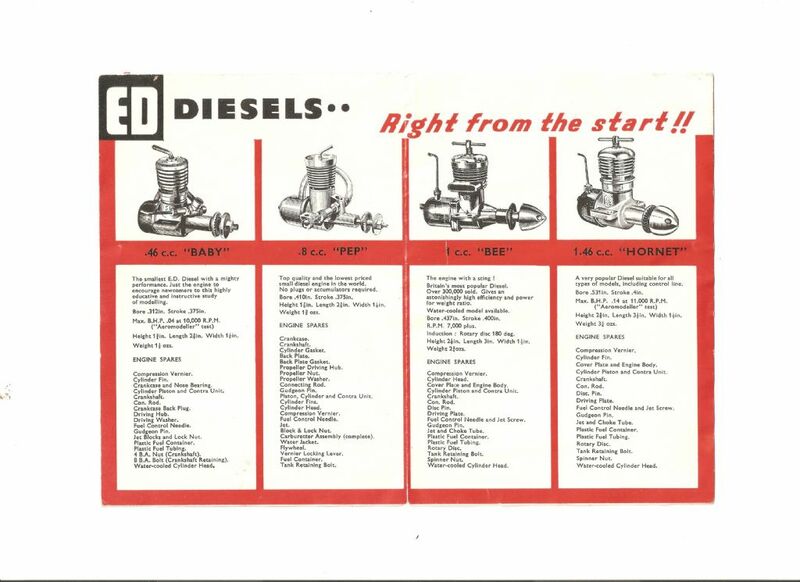 Note that the Pep crankcase is an exact copy of the OK Cub 049. Yeah, they're not without faults, but I possess two that run OK.